Is Cloud Just Another Name for Hosting? I made this in PowerPoint for Mac. Forgive me. 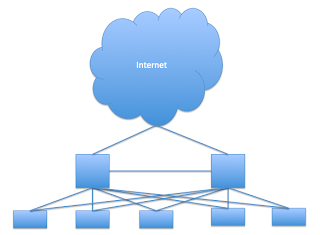 If you've spent any decent amount of time in IT, you've no doubt seen more than your share of "network diagrams" that always have one component in common: a big empty cloud with the word Internet at the top. Something like the diagram on the right. For server engineers, the cloud at the top of these diagrams was a place holder. It symbolized the domain of the network engineer, where crazy things like BGP and MPLS do... stuff. Packets come in, packets go out: you can't explain that! Then, 5 years ago, that cloud at the top started to have a new meaning. The cloud was no longer a placeholder, no longer just boilerplate for enterprise architects to pad their Visio drawings. Now it was an active and critical part of the enterprise. At first, many veteran IT professionals were quick to cast doubt on "cloud computing." It was just another name for hosting, or application server provider, or managed service provider. "In the cloud" was just another buzzphrase that meant "your server is in someone else's data center." It was still your server, still a physical server (ok, 5 years ago, it may have been a VM, but at least in the government IT space, it was probably still a physical machine), still running a traditional workload. It just happened to be somewhere else. Cloud computing is just another name for hosting, right? Well, no. It's easy to understand why so many people think of cloud computing this way. It's all those network diagrams, and a healthy suspicion of new technology that promises to change everything. But to condense the many concepts of cloud computing into "hosting" is to truly miss the point. Cloud computing is less about where your server is, and more about how your IT infrastructure supports your business. Sure, hosting may be part of cloud computing. But the core tenets of cloud (elastic computing, automation, orchestration, security, and availability) are individually and collectively more significant than the raised floor that supports your hardware. Remember the IBM marketing term "On Demand?" (full disclosure: I worked at Big Blue a long time ago. (fuller disclosure: I was an eight bar specialist in SecondLife)) Combine "On Demand" with hosting, and you're starting to get to the meaning of cloud computing. It's about the instant, automated provisioning of VMs to respond to changes in workloads. It's about the seamless migration of workloads to meet resource requirements. It's about the application of policy in a consistent, organized manner. And most importantly, it's about the efficient use of IT resources to satisfy your business requirements. So there you have it. A crash course in cloud computing. Feedback and questions are welcomed and encouraged! When the vExpert 2013 recipients were announced a few weeks ago, I quickly went to the winners list and did a Control-F to search for my name. Chrome found a match for Stump, and I started to get excited. Then the disappointment set it, as I realized that it was another Stump. And like that, I joined the minority of VMware geeks who applied but were rejected from the program. Self-doubt set in. I started to worry that I didn't actually know vSphere that well. Maybe I was spending too much time in the lab, and couldn't see the forest for the trees. Maybe I was so caught up in the details of VMTools on linux, or banging away at vami, or digging through fdm.log, that I has lost that larger perspective on how people were using vSphere in the wild. Eager to find a positive outcome for the situation, I set up a quick call with John Troyer to talk about my application, and how to prepare for the next go-round. I didn't anticipate how important that call would turn out to be. We talked about participating in the community, and how to raise my profile a bit. Attend VMUG and user conferences. Work up the nerve to present at VMUG. John knows the VMware community so well, that I started to get excited just listening to his advice. All of a sudden, I had a clear idea of how to get out there. As we ended the call, John suggested I contact Amy Lewis at Cisco. Of course, I had known of Amy (or rather @CommsNinja), but aside from a very brief chat at VMwarePEX this year, I hadn't connected with her. But if John thought it was a good idea to reach out to her, it was worth pursuing. Amy was kind enough to make time to talk with me about all things community, both from a Cisco Data Center and a VMware perspective. She's connected to so many of the stand-outs in these communities that it was a little surreal. We talked about the convergence of skillsets in the modern data center, and how the old dichotomy of server guys vs. network guys doesn't fly anymore. The importance of building a personal "brand" as opposed to having an online identity that's permanently tethered to your current employer (which by the way, sounds like a nearly universal problem!). We even talked about how to introduce more virtualization topics to the CMUG (the Cisco Mid-Atlantic User Group) that Chesapeake NetCraftsmen runs. I left that call with a renewed sense of community, and an even clearer idea of how to quit lurking in the virtualization circles. In retrospect, I'm now convinced that rejection from the vExpert 2013 program was a good thing. It forced me to analyze my current participation in the community, and reach out to some wicked smart people. It reinforced the important role that social media plays in staying educated and informed in data center and virtualization concepts, and yes, even marketing. And it encouraged me to focus my efforts on giving back to the community in more meaningful and visible ways. No CDP on UCS ESXi vmnics? Expand this item to see all of the policies that have been defined. To see which service profiles are using each policy, select the policy, then click Show Policy Usage. This is a great way to confirm how your changes will affect your hosts. It also works for all other policies, FYI. Find the Network Control Policy that your ESXi hosts are using, and take a look at the settings. 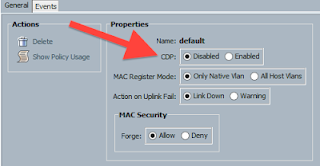 Is CDP enabled? Click the Enabled radio button, then Save Changes. That's it! Cisco UCS can be a challenging platform to work with, especially if you're unfamiliar with network, server, and virtualization concepts (I should lump storage in there, too!). If you've got questions, or are looking at transitioning to Cisco UCS, consider contacting Chesapeake NetCraftsmen (that's where I work!). I've done enough UCS installs and upgrades to know how to avoid common pitfalls, especially when running vSphere on UCS. Lately, I've been spending some free time with www.cloudcredibility.com. I'd started it a few months back, but when work started to get busy I let it slide for a while. Now I've decided to catch up and see what's new. Of course, the big change since the beginning of #CloudCred is VMware's major marketing push for vCloud Hybrid Service. So it should come as no surprise that CloudCred now features many tasks related to learning about vCloud Hybrid Service and its benefits. In fact, there's a contest that lasts about another week to win a FitBit One. All you need to do is complete a bunch (maybe two dozen, I haven't counted (yes I have, it's twenty six)) of tasks to be entered into the drawing. And in the process you'll earn a ton of CloudCred points. It's that last one that makes me laugh. It's because the Twitter mention isn't automatic (ironic, given that we're talking about cloud here). I received an email that says I'll be contacted by someone in the coming days to discuss the "prize details and approval process." It's funny that a simple tweet can be bound by such bureaucracy. Perhaps I should prepare a 27B stroke 6 in advance.